If you saw one of my most recent posts which shared my current favourite haircare products for Autumn, you would have seen that I included the L'oreal Paris Dream Lengths haircare range. For me, the star product is the No Haircut Cream, a total hair game-changer and has become a staple in my haircare routine. Enriched with a combination of Keratin and Castor Oil, that have some amazing benefits, you're definitely on your way to healthier, beautiful hair. - Keratin - a major component of your hair, as well as a vital protein found naturally in hair strands, which gives its structure. Also helps to maintain the smoothness, shine and strength of your hair, but also prevent from further damage. - Castor Oil - great moisturising and anti-inflammatory properties that help to keep hair soft and hydrated. 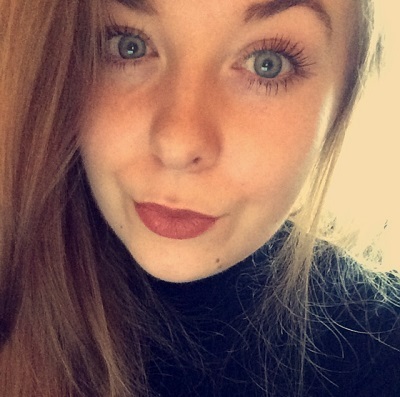 "Does the appearance of split ends and hair breakage make you feel like you need a haircut? Say no to cutting your ends!" I use the No Haircut Cream on my mid-lengths and ends of my hair, and I find the product absorbs quickly without any residue. The formula helps to reduce split ends and to reduce any breakage from brushing. The consistency is quite thick, but not too heavy or greasy on the hair, so it doesn't weigh it down at all and helps to detangle, which is great for us with long hair. It protects my hair from the use of heat, as well we the weather outside. So if you've not tried it yet, you definitely need too! Have you tried the No Haircut Cream or any other products from the L'oreal Dream Lengths range? Four Aussie Haircare Gems You Need To Try! When it comes to haircare, Aussie have been my go-to hair brand for as long as I can remember. To me, the brand is just so good, I have featured them multiple times on my blog over the years, including this post - Aussome Dream Team. I've tried so many of the Aussie haircare ranges, you only need to smell all the products to fall in love with them, and I know if my hair is in need of some TLC - Aussie is a brand that I repeatedly go back to as I know that their products work for my hair type and they can ALWAYS sort me out when I'm having a bad hair day! My holy grail hair treatment. The Aussie 3 Minute Miracle Moisture Deep Treatment is the only remedy you need for dry, damaged and thirsty hair. I use this deep conditioner once a week, all year round, but during the colder months, I use this twice as I like to keep my hair shiny and healthy during the colder, harsher weather. A hair treatment with Australian Macadamia Nut Oil - a lightweight oil that is quickly absorbed without feeling greasy, as well as being highly nourishing and softening. The perfect addition to your winter haircare routine. Something new that I've tried from Aussie is the Miracle Mega Kool Kiwi Berry Dry Shampoo. I've used Batiste in the past, but Aussie have stolen my heart with their new Miracle Dry Shampoo. Designed for those with normal or greasy hair, the dry shampoo refreshes the hair instantly and without make it look dull or leave any white residue. Formulated with Australian Jojoba Seed Extract - this is rich in vitamins and minerals that nourish hair, prevent hair loss and promote hair thickness. Like all Aussie products, the scent is to die for. With a beautiful, light berry aroma, it's so sweet and fresh, you'll definitely be getting ask what smells so good! This product, the Aussie 3 Miracle Oil Lightweight Treatment was so good, I dedicated a full blog post review to it! Intensive lightweight oil treatment for damaged hair, packed with Australian Macadamia Nut Oil, Jojoba Seed Oil and Avocado Oil- the perfect haircare combination! With a non-greasy formula, I like to use the Reconstructor on damp hair to help repair the smoothness and give my hair some much needed moisture after washing, as well as on dry hair for amazing shine effect and to tame any frizz. One of my most used and repurchased hair oils, it simply helps your hair look silky, smooth and fabulously shiny. What more could you ask for? The Aussie Mega Shampoo is the perfect product to use for hair that wants to be clean every day. This daily shampoo packed with Kangaroo Paw Flower extract, helps to cleanse the hair and scalp, and leaves you with beautiful, shiny locks. The shampoo lathers up really well, so you can work it into the hair and scalp for a good, deep clean. Maybe even a little head massage whilst you're there works wonders. After washing and drying, I'm left with super light, bouncy hair that makes you feel a solid 10/10! What are your favourite Aussie Haircare products? Have you tried any featured in this post? In regards to beauty, haircare is something I have always been passionate about and something that I love to explore in terms of trying new brands and new products regularly. For reference, my hair is medium length, never dyed, natural dark blonde hair. In terms of texture, my hair isn't very fine and it isn't thick, somewhere in between, naturally quite straight with a few wavy areas, and I do suffer with some dryness from time to time in the mid-lengths and ends of my hair. In collaboration with Panasonic beauty products uk*, I wanted to share some of my current favourite drugstore haircare products that will have your hair looking refreshed, silky soft and in tip-top condition! A a trio of haircare products that have become a firm favourite of mine and a recent addition into my haircare routine. Designed for those with long, damaged hair, the Dream Lengths Shampoo and Conditioner work like a treat for my hair. Enriched with Keratin, Vitamins and Castor Oil; this is the perfect combination to help protect hair against breakage and split ends. The No Haircut Cream is a total game-changer. The consistency is quite thick, but not too heavy on the hair, so it doesn't weigh it down at all. I use the No Haircut Cream on my mid-lengths and ends of my hair, and I find the product absorbs quickly without any residue. It protects my hair from the use of hair dryers and straighteners, as well we the weather outside. So if you've not tried it yet, it's definitely one to give a go! The primer is formulated by 100% natural ingredients, which in turn shields hair from brush and heat damage, as well as protecting from UV Rays and pollution. This powerful cream is great to tame any fine flyaway hairs, to smooth thick hair and help protect hair from heat styling. It conditions the hair quite well, I use this primer on the ends of my hair after washing and you can see and feel visible effects even after few uses. I've already dedicated a whole blog post solely for this product. It's become a solid staple in my haircare routine, and something I will purchase over and over again! Aussie 3 Miracle Oil Reconstructor is a lightweight oil treatment designed for those with dry and damaged hair. Blended with 3 miracle oils; Australian Macadamia Nut, Jojoba-seed and Avocado, encouraging your hair to look silky, smooth and shiny. A must have product all year round to save your hair from the hot summers and cold winters. Probably the cheapest product in my current haircare routine, but that does not mean its the worst! A simple yet effective conditioning spray that I always use before blow drying my hair. Formulated with Avocado and Manuka Honey, that helps to nourish the hair and to leave it feeling smooth and soft. It leaves your hair smelling so fresh and feeling so silky. If you're after a product that lets hair looks healthier with brilliant shine, this is definitely one for you! I've used this product on and off for a while now, but it is definitely something I always come back to due the the great results that it gives to my hair. With intense nourishment without weighing the hair down or leaving a greasy residue on your fingertips, it's perfect for those days where your hair is feeling that little bit more dry and damaged, or when you want to tame frizz and flyaways. This product has also had a whole blog post dedicated to it, because it's so damn good! You can view this post here. A product suitable for those with dry, damaged hair, it's perfect all year round; those hot summer days or those cold winter nights, Maui Moisture has got your back. A hair mask packed with amazing, natural ingredients; Aloe Vera Juice, Coconut Water, Creamy Shea Butter, Rich Coconut Oil and Pure Macadamia Oil, the perfect combination to improve the look, feel and texture of my hair. What are your current favourite haircare products? Have you tried any of the ones featured in the post? Do you have any recommendations for me? If your hair is in need of some serious TLC, you need to get your hands on the MoroccanOil Intense Hydrating Mask; the perfect summer staple, and a real treat to add to your haircare routine. A silky and thick hydrating conditioning mask, this is suitable for those with extremely coarse, dry and heat damaged hair, a great product to try for that added hydration and nourishment, to keep your hair looking healthy and shiny all summer long. "MoroccanOil Intense Hydrating Mask is particularly effective for dry, thick and coarse hair as it tends to be extremely dehydrated and requires added moisture to stay healthy." This hair mask has a super rich and creamy formula, suitably designed to hydrate and nourish dry and damaged hair. Concentrated with Argan Oil; this naturally and effectively adds hydration and shine back to dull, lifeless locks. After shampooing, apply a generous amount of MoroccanOil Intense Hydrating Mask all over the hair and comb it through so each strand of hair is covered with the mask. Leave for around 5 to 7 minutes, which is plenty of time to help recondition and reconstruct the hair, I sometimes leave on for around 20 minutes for a more deep condition so I know it will add the much needed moisture and elasticity back to my dry hair. Make sure to rinse out well, and finish with cold water to help keep hair looking strong and shiny. I've used the MoroccanOil Intense Hydrating Mask for a number of weeks now, and it definitely does a great job for the hair. My hair has definitely felt a lot stronger, looked healthier and more moisturised, as well as being more manageable and shiny. The condition of my mid-lengths to ends have improved 100% since using this mask, no more dry, straw-like hair! If you like to splurge and treat yourself when it comes to haircare, this is a great product to add to your haircare routine. However, if high-end haircase isn't for you, and you are looking for a hair mask that does a similar job to the MoroccanOil Intense Hydrating Mask, is more easily accessible and has a more affordable price tag, I would definitely recommend the Maui Moisture Revive & Hydrate Shea Butter Mask! Have you tried the MoroccanOil Intense Hydrating Mask? What other hair masks would you recommend for dry and damaged hair? When it comes to haircare, Aussie is my go to brand. I've used their products for years and years, they just have the perfect products to fulfil my haircare needs and I am never disappointed. I recently picked another bottle up of the Aussie 3 Miracle Oil Intensive Lightweight Oil. (It's sooo good, I'm on my third bottle!) A treatment specifically designed for those with damaged hair, I thought now the sun is shining, and the weather is warming up, this could be a great product to bring out to add to my Summer haircare routine, to help avoid heat damaged and my hair drying out. The product itself has a clear oil and serum consistency, which is easily absorbed into the hair. Blended with 3 beautiful, miracle oils ; Australian Macadamia Nut, Jojoba-seed and Avocado, encouraging your hair to look effortlessly silky, smooth and shiny. It smells super sweet, fresh and slightly nutty. Just a few drops spread through the lengths and ends of my hair gives plenty of moisture and shine with no greasiness and no sticky residue. Simply making my hair feel super soft, more manageable and tangle free. The directions for use are super simple, there are 3 main uses for this product and I honestly find all 3 very effective. I've used the Aussie 3 Miracle Oil Reconstructor Treatment over and over again. I just love the way it makes my hair look and feel; amazing shine, visibly nourished and makes it feel super soft. Retailing at £9.99, it's on the pricier side for a drugstore oil, but seeing as it gives amazing results from the first use and will last a really long time as a little goes a long way, I definitely think it's worth the investment! I reviewed some more Aussie products here. Have you tried the Aussie 3 Miracle Oil Reconstructor Oil Treatment? Recently I've been loving to use Sheet Masks. The harsh, cold air has left my skin feeling quite dry, lacking moisture and pretty dull looking. I've reached out for the Tony Moly Pomegranate Sheet Mask, as well as the Garnier Moisture Bomb Green Tea Tissue Mask to help keep my skin refreshed and hydrated, as well as looking quite plumped and soft. If you've got long hair, you'll know the struggle for keeping your hair looking soft and silky. As an avid haircare lover, I've tried my fair share of hair oils, and my favourites so far have been the Superdrug Hair Therapy Oils with Argan and Macadamia. These hair oils are super nourishing, absorbing quickly into the hair without leaving a sticky texture or greasy look to your locks. One of my most repurchased homeware item ever; the Primark Sea Salt and Lavender Room Diffuser. For only £3, this is an absolute steal, keeping any room smelling fresh all day long! If you've not tried any room diffusers, I'd head yourself down to Primark asap! A holy grail favourite of mine is the Soap and Glory 2 in 1 Brow Archery. I pick up the shade "Love is Blonde" and find this a perfect match for my hair colour, a lovely cool toned dark blonde colour. One end of the brow pencil has a small brush; great for brushing through the brows and distributing the product for a natural brow finish, the other end having a small, retractable brow pencil; giving you a precise and defined brow, whilst still looking natural. If you're after a good, affordable brow pencil, you should check out Soap and Glory. As a mascara lover, I definitely had to get my hands on the most hyped mascara of 2018. You guessed it - Benefit BAD Gal Bang Mascara. For mascara, I usually stick to my trust Rimmel Lash Accelerator Endless mascara, but with lots of rave reviews and amazing photograph results, it was definitely something I wanted to get my hands on! I found this mascara to give lots and lots of length, perfect for those who love a full and fluttery look to the lashes. The plastic bristle brush is great for lash separation and reaching all the lashes, to get a thick, jet black coat. A skincare favourite of mine has been the L'oreal Paris Smooth Sugars Kiwi Clear Scrub. The scent of this scrub is to die for! So fresh and fruity, it's a great addition to my skincare routine. From the first few uses, I saw instant results, immediately my skin appeared to look softer, clearer and more radiant. The kiwi seeds are very gentle on the skin, so perfect even for those with very sensitive skin, and a perfect consistency to help to clear and eliminate blackheads. 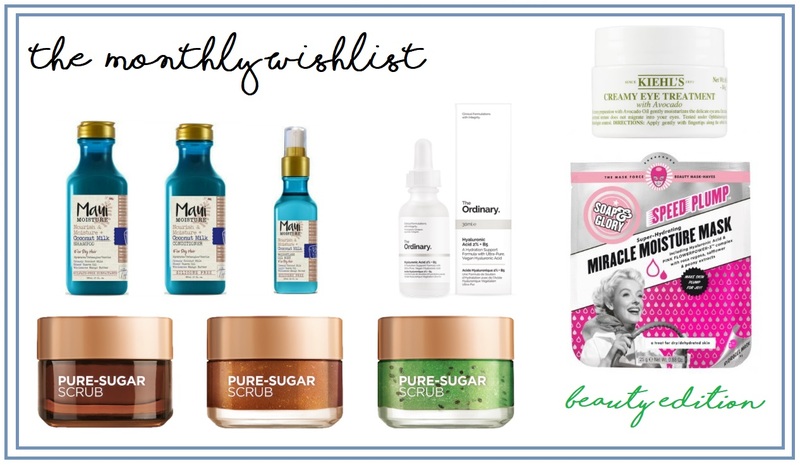 There are two other formulas in the range, the Cocoa Nourish and the Glow Grapeseed scrubs, something I definitely want to try asap! And my final favourite for March has been the Nescafe Cafe Menu Toffee Nut Latte Sachets. I love coffee and these are a great, super speedy and delicious product, perfect for when I need my coffee in the morning. I've tried lots of the other flavours from the Cafe Menu range, a few of my past favourites have been the Caramel Latte and the Double Choc Mocha, but whilst browsing my local supermarket, I saw the Toffee Nut Latte as a new addition, so I definitely wanted to give it a try, and it is definitely delicious! 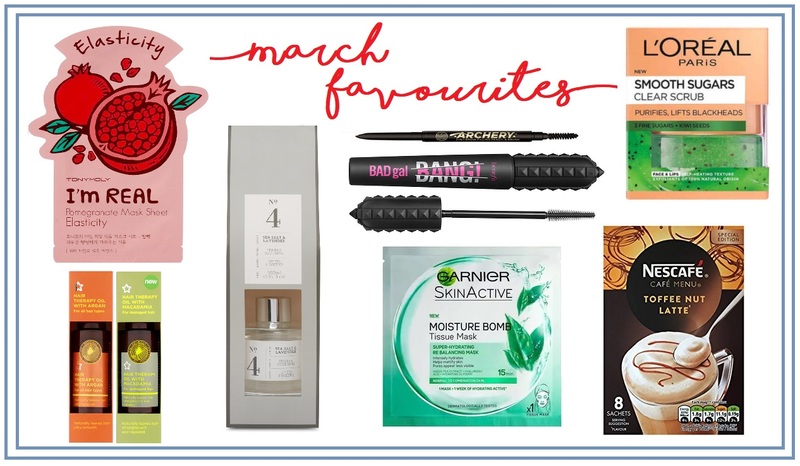 Have you tried any of the products featured in my monthly favourites? What have you been loving this month? When it comes to my haircare routine, I'm always swapping and changing the products I use. 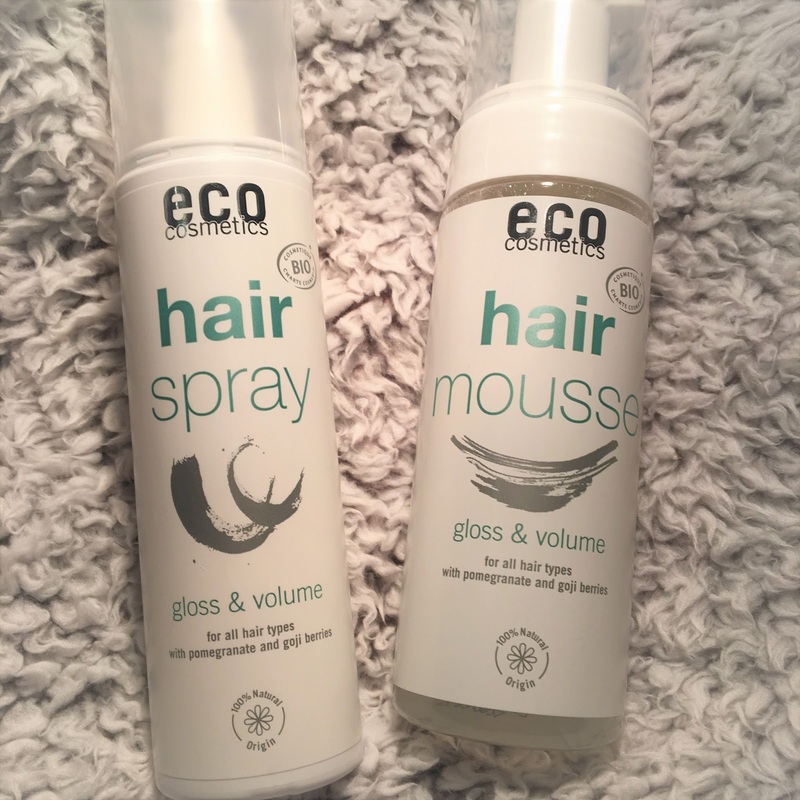 I love to try out new products and new ranges that brands bring out, and when ECO Cosmetics reached out to me and asked if I would be interested in trying out a couple of new products from their hair styling range, I couldn't say no! German-based brand Eco Cosmetics has launched its hair styling range, fully natural and organic, containing ingredients like Goji Berries and Pomegranate, a perfect combination for nourishing the hair whilst boosting the appearance, volume and shine. The range is certified by Ecocert, contains organic ingredients and is cruelty-free. "This styling foam gives your hair volume and hold. No more frizz, even in damp weather! Enriched with goji berries*, it provides strength and protection all day long. It makes styling easy and leaves your hair feeling silky smooth, shiny and full of body. Precious pomegranate extracts* protect the skin and hair from drying out. Hair stays smooth and supple even after repeated use." "Nourishes your hair and protects it from drying out. Enriched with goji berries*, it provides strength and protection all day long. Hair feels silky smooth, shiny and full of body. Precious pomegranate extracts* protect the scalp and hair from drying out." After trialling these two haircare products from ECO Cosmetics over the last month, I have to say I was quite impressed. 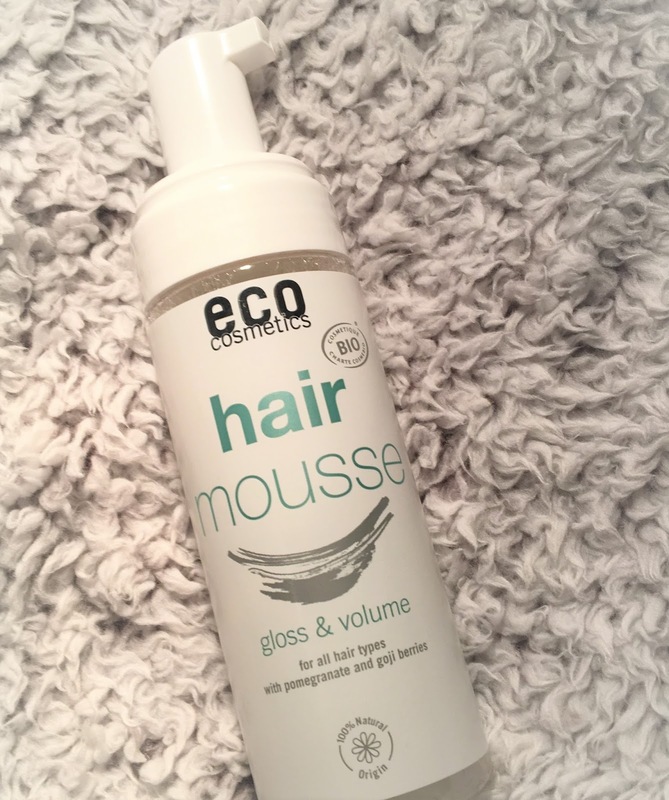 I don't really tend to use hair sprays or mousses in my usual day-to-day haircare, but the Hair Mousse from ECO Cosmetics in particular was a great addition to my haircare routine. The mousse itself was very lightweight, and not at all sticky, so it didn't weigh down my hair at all. The natural ingredients packed into the products helped my hair to maintain a healthy shine and appearance, adding some volume and I also found that my hair was less frizzy after washing and styling. The hairspray was unlike any other hairspray I have used before. 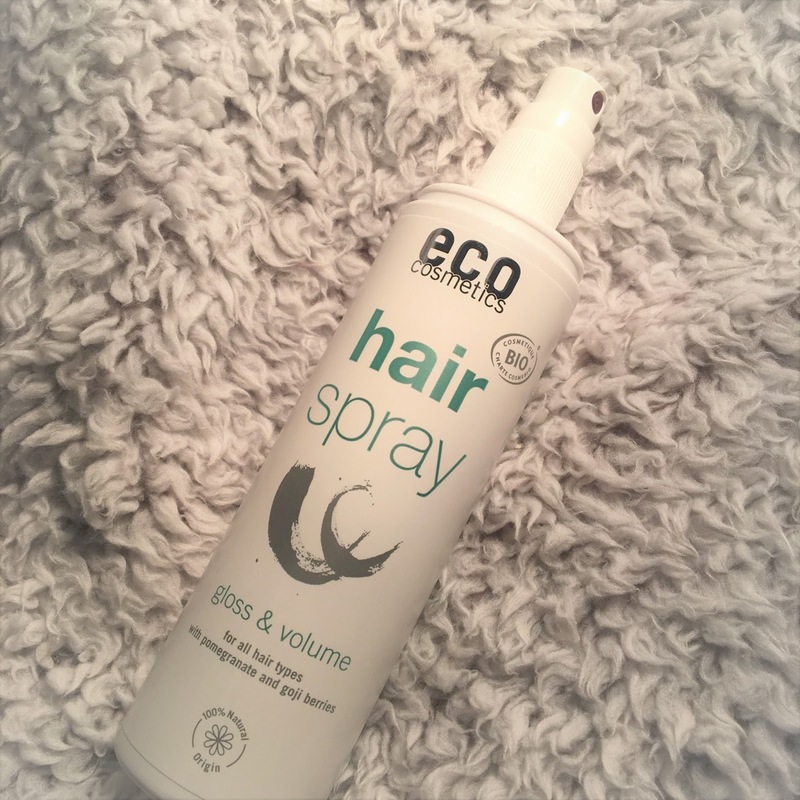 If I was to use a hairspray, it would most probably be in an aerosol sort of can, however this hair spray from ECO Cosmetics is an actual spray like consistency, similar to a facial mist, not something I was expecting or used to at all. However, when using the hair spray after styling my hair, I found that my hair was still in very good, healthy condition, and not looking dry and crispy-like some hair sprays can do to your hair. Have you tried ECO Cosmetics before? What are your favourite haircare products? * PR Samples gifted for review purposes. All opinions are 100% honest. So, if you're a long haired girl like me, you may want to keep on reading! I was recently contacted by the lovely people at Save The Blow Dry, asking me if I would like to be sent there Turquoise Shower cap*, to which I said yes straight away as this is something which I would definitely find very useful! I've never been a shower cap kinda girl, I usually tie my hair up in a messy bun and get on with things, but since receiving this a month or so ago, I have been using the Save The Blow Dry shower cap when I shower/bathe, I don’t wash my hair everyday but obviously I do shower/bathe daily, so this has definitely been a miracle product that I am extremely impressed! Blow drying my hair is one of my least favourite things to do ever. It makes my arms ache and just takes far too long. They claim a 100% best blow dry protection guaranteed. It's unlike ANY shower cap I have ever used before, for good reasons! Can we just take a moment to admire how cute the design of the shower cap is. It's just so pretty! I think having the printed hair accessory designs on the cap is a really lovely touch, but its not too over the top, which makes this a unisex piece. The size of the shower cap is rather massive, so you girls with thick, voluminous hair, this caters for you too! Another really cool aspect of this show cap, is that if you turn it inside out, so the plastic side is inside, you can slap on a hair mask for a few hours or overnight, without making a mess of your clothes or bed! Genius! Have you heard of the Save The Blow Dry Shower Cap before? Would this be something that you would be interested in purchasing? So the next instalment in haircare week comes in the form of a serum; Goldwell Dualsenses Rich Repair 6 Effects Serum*, which I was kindly sent from lookfantastic/hqhair. Hair serums are still quite a new thing for me, and so far I've tried and tested a few and have been really happy with how they leave my hair looking and feeling, so having the opportunity to test this one from Goldwell is something I was excited for. "An innovative 6-in-1 solution for hair that's in need of some TLC, this Dualsenses Rich Repair 6 Effects Serum from Goldwell is your fast track to super soft, silky hair. Boasting six repairing benefits, this effective serum gives your hair instant shine with an anti-frizz effect, healthy ends and improved elasticity." Goldwell DualSenses Rich Repair 6 Effect Serum is a 6-in-1 solution, helping to improve instant shine, silky suppleness, improved elasticity, anti-frizz effect, healthy ends and reduced hair breakage. The serum comes in a handy pump dispenser, which means you can control the amount of product you dispense, where I usually take 2-3 pumps and rub this together in my fingertips, then apply to the lengths and ends of my hair. The non greasy formula that feels really light and absorbs really quickly into the hair, leaving it feeling silky and no greasy residue is left behind. I usually use this on freshly washed hair, once its towel dried, and find that this works best for my hair, but also if my hair is feeling a little dry, I will smooth 1 pump of this through the ends to give it a little refresh and nourishment. From the first application of this serum, the appearance of my my hair was definitely a lot better. It was so smooth and silky, without any frizz. Big yes! My hair felt thicker and healthier, shinier and more manageable, and for someone with long hair, this is definitely a plus! A definite recommendation to anyone with long hair, dry hair or those just looking for a serum to improve the texture and appearance of there locks! Have you used this hair serum before? What serums do you like to use? "The lightweight, luxurious formula is instantly absorbed to help nourish and reduce frizz, providing the ultimate salon indulgence to instantly transform your hair." Hair oils are still quite a new addition into my haircare routine, since using the THIS ONE Light Hair Oil, I have been hooked and oil treatments are something that I am using atleast once a week to keep my long locks in the best possible condition. I recently picked up the TRESemme Liquid Gold Argan Oil, a lightweight hair oil which helps to nourish the hair, improve shine and tame frizz, whilst making your hair feel sleek and soft. And boy does it do that! As for how I use this, I simply pump two or three little drops into my hands, rubbed them together then worked it through the lengths and ends of my hair before blow-drying. It made my hair feel amazingly soft, my ends are no longer straw like and dry and I found that my hair is so much more manageable when brushing, and no greasy residue is left. I thing I absolutely adore about this hair oil is the smell, its delicious. Think Aussie haircare products, and this is what that smells like. So fresh and fruity. Just amazing! Have you used TRESemme Liquid Gold? What are your thoughts? What hair oils are you using currently?